Combine chicken, salt and soy sauce. Let stand 15 minutes. 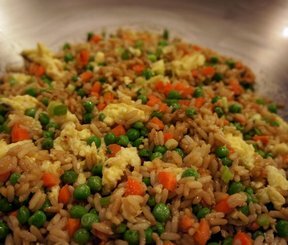 Cook rice in hot oil in skillet over medium heat till golden brown, stirring frequently. Reduce heat; add chicken with soy sauce and broth. Simmer, covered for 20-25 minutes, or till rice is tender. Remove cover last few minutes. Mix onion, pepper and celery into rice. Cook, uncovered, over medium heat a few minutes longer till liquid is absorbed. Push rice mixture to sides of skillet. Add eggs; cook til almost set; blend into rice mixture. 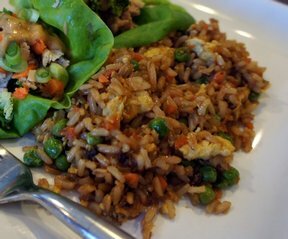 Stir in lettuce; serve immediately with soy sauce. Serves 6.